In this month of family vacations, celebrating freedom and enjoying summer, we hope you take a moment to see what we’ve done on SGN Scoops! We present to you a magazine filled with freedom, hope and all that is good in today’s Southern Gospel and Christian Country music! 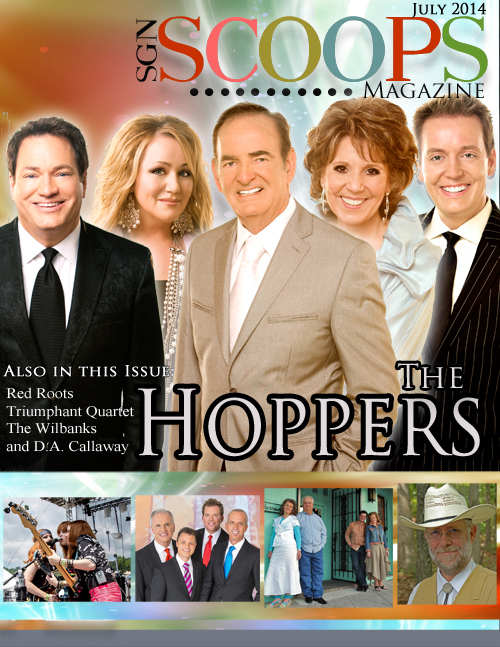 July brings a whole host of features, including our cover story on America’s Favorite Gospel Music Family, The Hoppers. Craig Harris takes an in-depth look at the past, present and future of The Hoppers through the eyes of each of the family. Learn why Claude is smiling more these days and Karlye is studying hard. Read about Dean’s and Michael’s role in the group business and why Kim is humbled by her career. Take a close look at the ‘Mother’s Heart’ of Connie Hopper and why she smiles even more widely at the thought of what may be in store for Lexus. A terrific summer read!! Dixie Phillips fills us in on another of Southern Gospel’s families, the Wilbanks; Marcie Gray tells us all about the Southern Gospel Music Associations’ Hall Of Fame and new contributor Dan Duncan interviews Christian Country artist James Payne. Speaking of Christian Country, don’t miss Natalie Taylor’s first-hand account of Red Roots’ appearance at Creation Festival NE 2014. Jennifer Campbell shares her experience as part of a short-term missions trip to New York City. Lorraine Walker highlights Triumphant, who have just released a new praise CD, and Cross Pointe, whose new video can be seen on the right of the SGN Scoops website. Don’t miss the activities of Lou Wills Hildreth as she shares her Love, Life and Legends column; David Staton’s ‘Can You Handle The Truth;” life moment devotions by Dr. Jeff Steele, Kelly Nelon Clark and Sherry Anne; and the must-read Younger Perspective by Erin Stevens who interviews Riley Harrison Clarke. Lorraine also brings us closer look at D.A. Callaway, the man behind Silver Dollar City’s Southern Gospel Picnic! Other highlights include ‘Event Planner’, a concert review of the Karen Peck and New River Homecoming by Lynn Mills; super New Music reviews by our own Sandi Duncan Clark; and the new DJ Spotlight by everyone’s favorite southern DJ, Vonda Easley. And don’t miss Sandi’s “Letter From…” in the first part of the magazine. Our publisher, Rob Patz, gets to the heart of things with a few thoughts on ‘Freedom’ in his Publisher’s Point. He also gets to interview his good friend, Pauline Patterson, in his column, ‘What America Wants To Know About…”. All this plus a Creekside Update, SGN Scoops Top 100 and much, much more! Read what is encouraging, uplifting, creative and gifted about our Christian artists and their ministries. We hope you have time this month to put your feet up on your lounger, grab your iced tea (or coffee!) and open up SGN Scoops July magazine. You won’t be sorry! 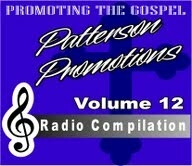 Patterson Promotions Vol.12 has shipped this week to radio nationwide and is available for download on their website for DJs Only. This compilation features The Wilbanks with their new release “Teach Me To Wait” that has potential to be another charting single for this family group. It also features Peach State Qt. with a patriotic song produced by Phil Cross entitled “We Will Stand” with great response nationwide in live concert settings this song proves to be one of their best. Darrell Luster’s “A Mighty Big God” radio all across this nation and their listeners have welcomed Darrell back to SG radio with open arms! Brenda Whitlock with a toe tapping “Double Dose” (of the Holy Ghost) you will surely like this one. Tim Livingston’s “He Gave All He Had” a heart touching song! Tim’s video same title can been seen on You Tube, we welcome Sharron Kay King with “A Little Hope” with smooth vocals and a message you won’t soon forget, Cross Pointe with their follow up single “Time After Time” this one should get you to moving. Pattersonmusic@att.net or call 606 528-0033.